Welcome to the story of Despereaux Tilling, a mouse who is in love with music, stories, and a princess named Pea. It is also the story of a rat called Roscuro, who lives in the darkness and covets a world filled with light. And it is the story of Miggery Sow, a slow-witted serving girl who harbors a simple, impossible wish. These three characters are about to embark on a journey that will lead them down into a horrible dungeon,up into a glittering castle, and, ultimately, into each other's lives. What happens then? 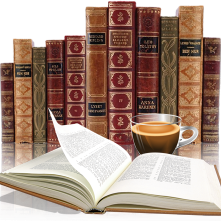 As Kate DiCamillo would say: Reader, it is your destiny to find out. I have wanted to read this 2004 John Newbery Medal Winner for so long. I found this lovely illustrated hardcover at my local Value Village (like a Goodwill) and it just had to come home with me. Another book that I enjoyed, it had that fairy tale quality that I love. The words just flowed, the writer has a real talent here. Who couldn't help feeling for little Despereaux the 2 oz mouse, or Pea the princess, Mig with her cauliflower ears and even Roscuro the rat (well kinda). However there is some parts that might frighten little ones - Mig being sold my her father and beaten by her 'owner'. 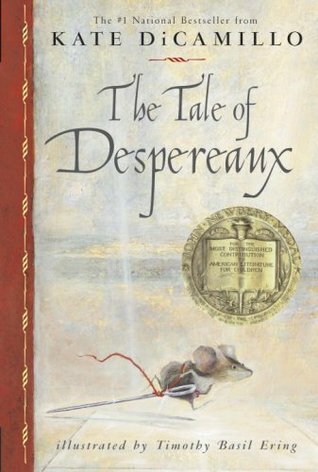 Despereaux basically rejected by his family because of his size. Do the four get their 'happy ever after' in the end, well I guess you will have to read the book to find out.